I always view facebook with most recent posts selected and that ensures that I see new posts and hopefully I see ALL the posts. I don’t get any choice like this on my phone. You can’t avoid, however, the bleating posts from people complaining that their posts aren’t being seen and asking people to like or comment on their posts to help them beat the odds. Social Media Safety – are we exhausted yet? It’s a new academic year in the Southern Hemisphere and so we begin a new round of Social Media Safety lessons. They exhaust me – both in their naivety and in the willingness of others to like the post and therefore preach a message they themselves haven’t taken on board. What would be of greater value is for the schools to get the kids to find the posts just like this one that have been made and catalogue the relative success of the posts and to distill what any changes might mean. Read the postSocial Media Safety – are we exhausted yet? Every so often you stumble across a site that looks like it might just be the legitimate face of a legitimate business but then you scratch the surface and, oh dear, it’s not. Take a look at this doozy. 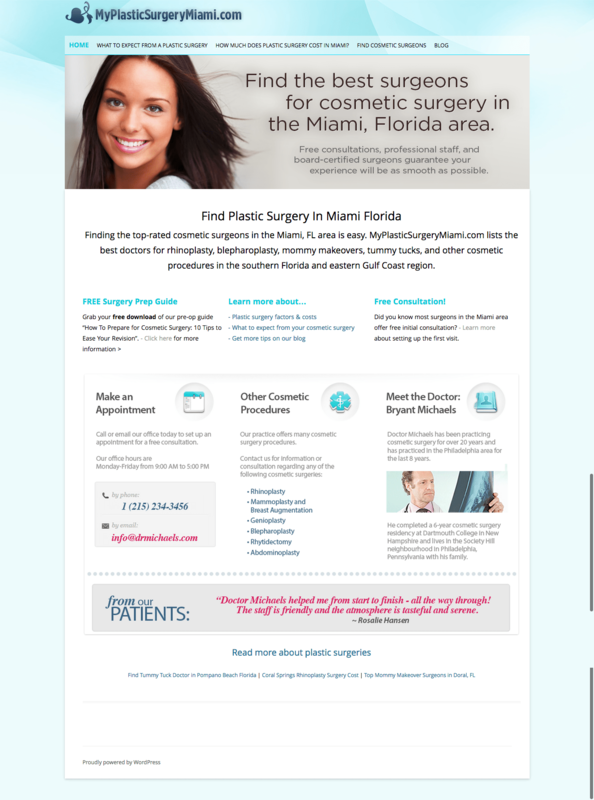 Plastic (ie cosmetic) surgery for Florida, Miami. Given the stereotypes for that state I imagine there’s lots of demand but I may be wrong. I’d expect the well established clinics to have domains that use their names and that perhaps a keyword domain, such as the one pictured on the right, to belong to one of the newer, hungrier clinics. This one looks good, it has a patient testimonial and info about Dr Bryant Michaels. Quite why he lives in Pennsylvania when he’s practicing in Miami is beyond me but my US geography isn’t too hot and maybe that works for him. I’ve used Xenu for years – probably as long as I’ve been coding websites – and it’s been around longer than that. You’ll see from the website that it’s incredibly old school, but sometimes the tried and tested tools are the ones you should stick with. I’ve just helped a friend merge two sites together and we’ve used mysql to change some of the internal links but there’s still a chance that some might have been missed. Xenu will let him know what the state of play is. Lots of small companies don’t get it right with their websites and, to a certain extent, that’s ok because their focus is on their core business. Pump – the makers of plastic bottles they fill with water – are owned by Coca Cola Amatil and, it could be argued, they are an enormous marketing machine whose product costs less than the packaging, distribution and marketing do. Being part of Coca Cola there’s the expectation that they will do marketing well, really well. So I was really surprised at this little snafu. Surely the company has guidelines for different types of marketing activity – or a template of tried and true steps. I know they’ve done this kind of thing before in NZ, surely they have in other countries too?! Don’t they share their knowledge within the company? I love social login and use it frequently on sites where I want to comment or buy something. I’m a bit choosy about when I use Google, Facebook or opt to create an account using just my email. Digitalpoint forces new users from certain countries to use Facebook to create their accounts – figuring that by adding a step it’s that little bit harder for spammers and scammers. It’s an interesting idea but it’s hard to say it’s working. Take the Rita’s for example.